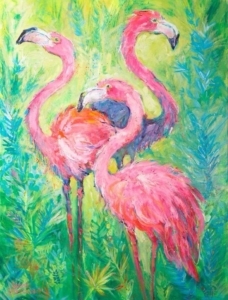 I hope you’re making plans to join Vino’s Picasso Naples for Lovegrove’s Flamingo on Wednesday, June 28. It’s from 6-8 p.m. at 2367 Vanderbilt Beach Road, #805, in Naples. 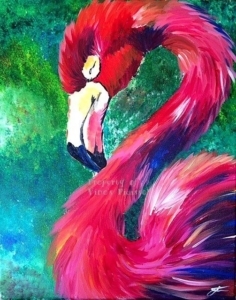 The experts at Vino’s Picasso will be walking participants through the easy-peasy process of painting the delightful pink flamingo pictured at the right on a 12 by 16 inch canvas (although you can upgrade to 16×20 for just $5 more). 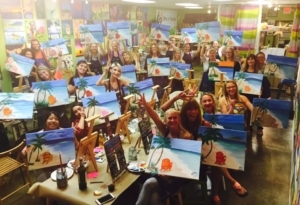 When you’re done, you’ll have memories you can treasure, along with your very own Lovegrove-inspired painting. Flamingos are as rare as they are beautiful. Think about it. Have you ever seen one in the wild? No, not the ones that populate Busch Gardens or the Naples Zoo. I mean that you just happened to come across when you’re kayaking or bird watching. The answer is no, you haven’t, unless you frequent Stormwater Treatment Area 2 out in the Everglades. And the reason I know that is that because by the end of the 1890s, they were all but eliminated from the State of Florida as a result of feather and egg harvesting. Then, in 2014, a handful of pink flamingos was discovered in STA2, which is a 9,000 acre wetland that’s designed to remove nutrients from the water supply. It’s possible that these particular birds broke free from the captive population that’s spent the past 73 years at Hialeah Racetrack in northern Miami-Dade County, or they may have migrated up from the Bahamas or Mexico. 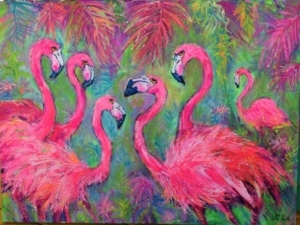 It is possible to take a tour through the Audubon Society of the Everglades out to STA2 to see the flamingos, but wouldn’t it be easier, less costly and a whole lot more f un to go to Vino’s Picasso Naples?